Here are some new collections that you may or may not already be aware of! 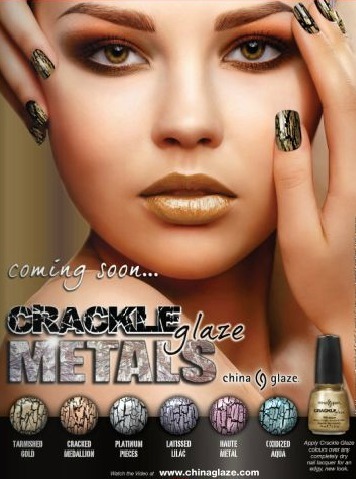 China Glaze Crackle Glaze Metals (July release), Color Club Fractured (should be released any day now! 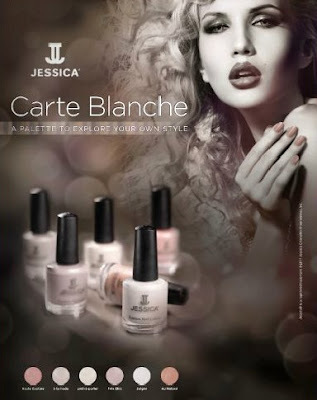 ), and Jessica Carte Blanche Summer 2011 (available now). the china glaze look amazing! I hope Color Club will sell this one as a collection at Ross. But I do favor China Glaze Crackles. That floating head in the Color Club ad is creepy! But I'll forgive them since I love their polishes. :) And thanks for the collection news Mary! I can't wait the Cg collection! I'm really excited for the China Glaze crackles. Hopefully by then, I will have some moneyyy. Where did that Color Club girl neck go? They look great! Fingers crossed the collection will come to Ireland! The China Glaze Crackles look might delicious! Now I get it, Color "Fractures" the young girl's head has been "fractured!.." But love the first poster for "China Glaze Crackled Nail Glaze Metals, especially love the color she is wearing on her nails, beautiful and gorgeous!